The simple kidney bean has many other health benefits. 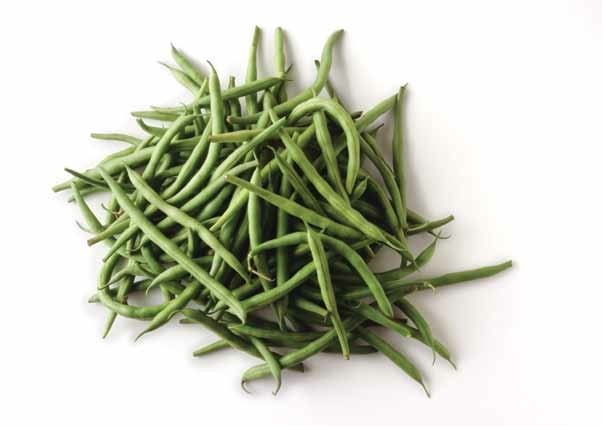 Rich in dietary fiber, this helps reduce cholesterol levels in the body and regulate blood sugar levels. Lowering cholesterol levels also reduces the risk of stroke, cardiac arrest, and peripheral general disease. Kidney beans contain both magnesium, zinc, and vitamin K, which may help prevent cancer. Studies have shown that regular consumption of kidney beans and lentils by women lowered their chance of getting breast cancer by almost 24%. Known as a healthy carb, kidney beans are good source of the B-vitamins. A serving provides 58% of daily recommended intake for folate and 19% for thiamin. Thiamine, a vitamin B complex, is essential for normal metabolism and nerve functions. Kidney beans are a rich source of iron. Iron is essential in all diets, but especially for pregnant women and people who suffer from anemia. Obviously, this peasant bean packs a healthy punch. 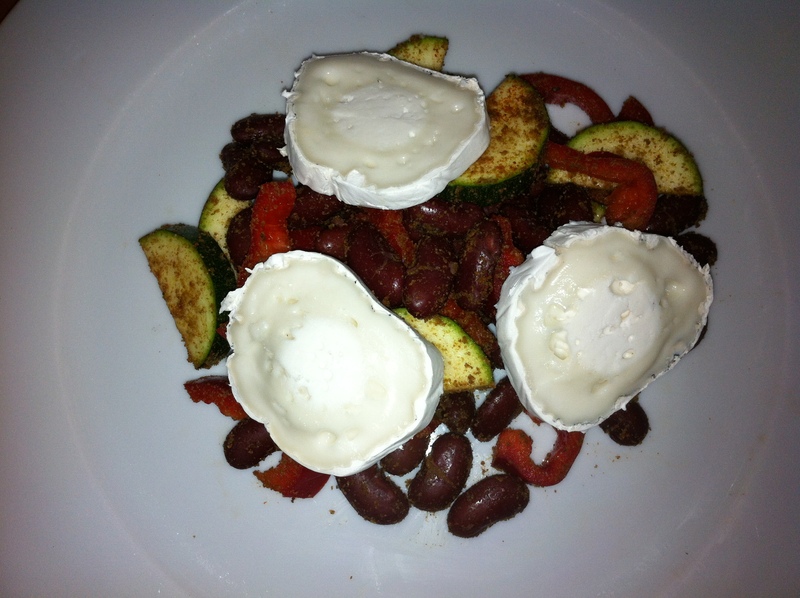 Arrange the goats cheese on top and serve. You can probably tell that it’s asparagus season and I just had to share with you a new simple and delicious recipe with this wonderful, delicious and nutritious vegetable. Know as an aphrodisiac in the western world this come from traditional Indian medicine, were it is used to strengthen the female reproductive system and increase sperm count. 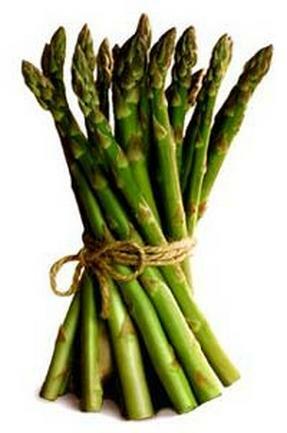 Asparagus contains vitamin K, essential for blood clotting and strong bones as well as vitamin B. The benefits go on, helping protect your blood vessels, it’s anti – inflammatory and cancer fighting. Full of fibre and good gut bacteria. I personally wish that it was readily available all year round! The only downside is that it can make your wee smell a little funny but the benefits out way this for sure. Simply steam the asparagus for 1-2 minutes – it should be just softened and retain shape. Take from the steamer to a serving bowl squeeze over half of a lemon and half of mint – taste. Pour over a little linseed oil. Adjust to taste, you can garnish with a slice of lemon and whole mint so guests can decide for themselves. I’m going to talk a little bit on the benefits of lambs liver. Lambs liver is full of protein and iron. One serving of liver also has 46 percent of your daily recommended amount of iron. It’s also high in potassium, phosphorus, vitamins A and C, and includes 99 percent of your recommended daily amount of copper – which is an anti-inflammatory as well as helps pigmentation of skin and hair color. As with most things, it’s important to find grass fed organic lambs liver. The liver filters through all the body’s toxins, but does not store them. Even so, it’s best to be sure you are not ingesting any antibiotics or pesticides by eating organic. Try this and you won’t be disappointed! I was at the market the other day and ran across a gorgeous bunch of radishes. So bright red and lovely, with just a little bit of spice on the inside. Sounds like some people we know, huh? The great thing about the radish is not only it’s crunch, but also how healthy it is for you. The radish is packed full of vitamin C, which helps strengthen the immune system and detoxify our bodies. 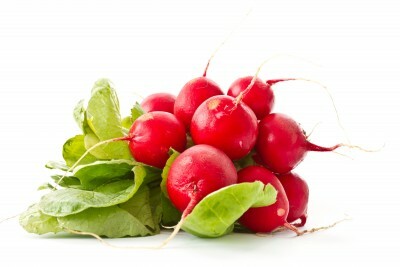 The antioxidants in radishes can also help protect us from free radicals that may cause cancer. The radish is a low glycemic index food, which means it helps regulate your blood sugar levels. This helps keep your metabolism at an even keel and will help you lose weight. Radishes contain potassium, which helps with muscle cramps, brain function, blood pressure, anxiety, stress, metabolism, a healthy heart and kidney functions. Radishes contain folic acid, which is necessary for the healthy development of our cells, a healthy brain and protection from cell damage that may lead to future cancers. Here’s a recipe for radishes that will give you a spicy crunch. I cook with loads of garlic. Not only does it ward off vampires, but because it has so many health benefits. Garlic has been used for thousands of years for medicine as well as for food. Even just after the first World War, it was used as a natural antibiotic when penicillin ran out. Today, research has shown that garlic helps lower cholesterol, blood pressure, and is a natural blood thinner. Heart healthy as well as helping prevent strokes? That’s a pretty powerful plant. A clove a day helps your body fight off the common cold and provides your body with vitamins A, B, C and minerals including potassium, calcium, magnesium and zinc. Research has shown garlic also helps strengthen the immune system which can help certain cancers. Researchers found a 30% reduction in risk of colorectal cancer among people who ate raw or cooked garlic. 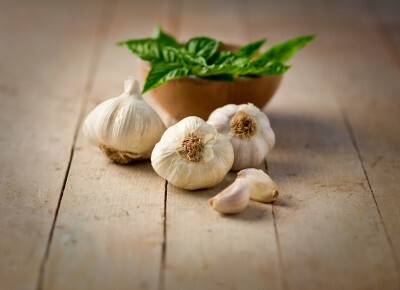 Seems like a little garlic every day can help ward many things away…except maybe bad breath. Fry off onion and paste. Once onions are starting to turn transparent, add the garlic, ginger and chillies. Add in the stock, lemongrass and lime. Bring to the boil. 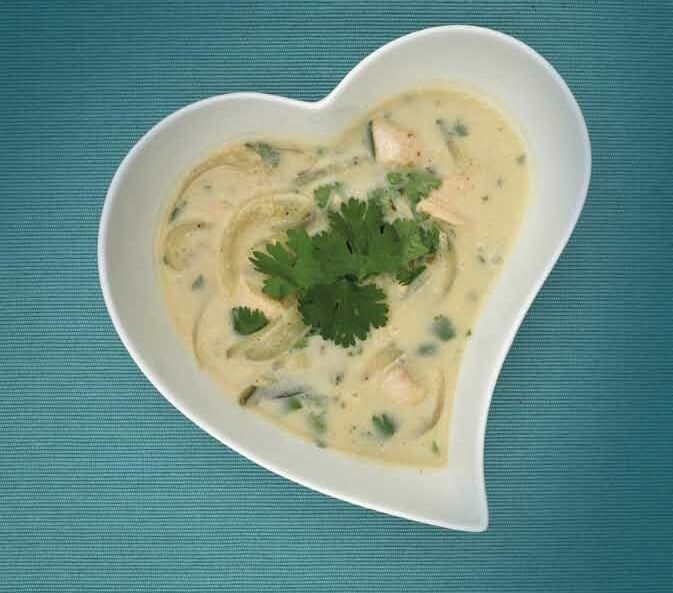 Turn heat down, add lime leaves and coconut milk. Slice chicken into small cubes, add to pot and simmer for approx 40 minutes. Just before serving add the peanut butter and French beans. You may want to add some Agave nectar to taste. 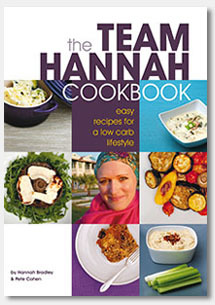 Yesterday I was lucky enough to promote the Team Hannah cookbook on the radio. 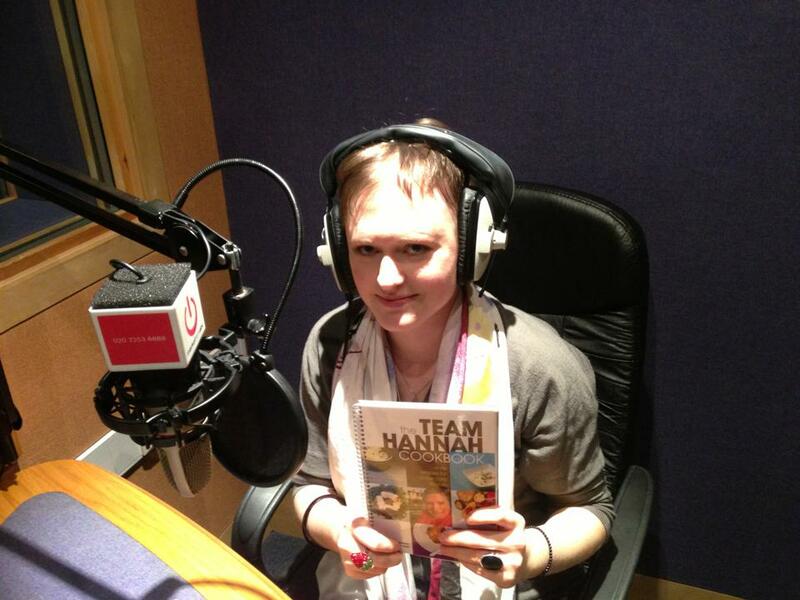 Thank you everyone for your lovely comments and for supporting me. I’m really grateful to you all. My friend sent me some Linseed oil, also called Flaxseed, I have used it before but only now I am completely drawn to it. I think this is why! Omega 3,6 and 9 are in my opinion essential for everything to work in the body, it oils joints, protects from heart disease and many other degenerative diseases and Linseed is jam PACKED with them. It has a smooth, nutty taste and the brighter shade of yellow the better, if from a good source that will not be a problem. Please do not cook with the oil, it damages the omega’s as they do not stand up to heat and keep the fridge in between uses. Use in salad dressings, pour on top of soups before serving or over cottage cheese which is my favourite at the moment! You can also Flax meal – this is the ground up seeds of which the oil is made from. Sprinkle on salads, add to my Grainless Porridge or smoothies etc. Flax meal promotes colon health, promotes healthy skin and helps regulate blood sugar. All in all it is an amazing oil to use regularly and I challenge you to try it! Why do I use almonds so much in my cooking? Clear your head of the idea that nuts are fattening, especially almonds. 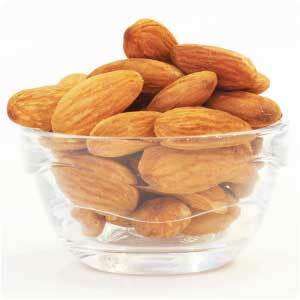 Almonds are our oldest cultivated nut, those of us that are health conscious should not avoid them because of “fat”. They are richly used in the Mediterranean cuisine, which is associated with lower levels of heart disease and cancer, oh and a longer life span as well. They contain rich sources of calcium, phosphorus, vitamin E and magnesium. As they have a low glycemic index they are amazing for balancing blood sugar levels. I would encourage you to go for good sources of nuts and for organic where ever possible. I use www.buywholefoodsonline.co.uk They have a great selection.